As customers look to build a roadmap for their journey to S/4, one of the first steps is to write a business case to assess the value of S/4 HANA for their organization. A business case not only quantifies the value and return on investment of the transformation to the business, but it can also highlight many of the qualitative benefits as well. Holding value discovery workshops will identify current pain points and challenges within the business to help build the case for change as part of a digital transformation. Pain points can often be attributed to limitations and technology constraints of IT systems implemented many years ago that have not been able to keep pace with the growth of an organization and changes in technology. Can we also leverage the wealth of information and vast amounts of data that is currently in legacy ECC environments to help support the benefits and value that will be realized with S/4 HANA as part of a digital transformation? The short answer to this question is “Yes”! This blog series will provide you with an introduction to SAP’s STAR+ service and tools. In Part I of this series, I’ll be providing an overview of the steps involved to uncover the nuggets of data in your current ECC system, and preparing for the workshops during which we will explore the opportunities to build your case for digital transformation. STAR stands for System Transformation, Assessment and Realignment. During the first few weeks of a STAR engagement the focus is primarily on the System and the Assessment, where SAP works with each customer to run a system scan against their legacy ECC environment(s). The scan typically covers a 3-month time frame to ensure there is opportunity to gain insights into the day to day operations of a business, as well as into any month and quarter end activities. The scan runs in the background and, once completed, provides a data file that is then analyzed. To prepare for the workshop SAP will leverage our intimate knowledge of our customer’s industry, business strategy, and business imperatives, to ensure executive alignment for the objectives and deliverables of the STAR+ service. As you can see in Figure 1, the first few weeks of a STAR+ service focus on gathering information about your business, your industry, and your current IT systems. 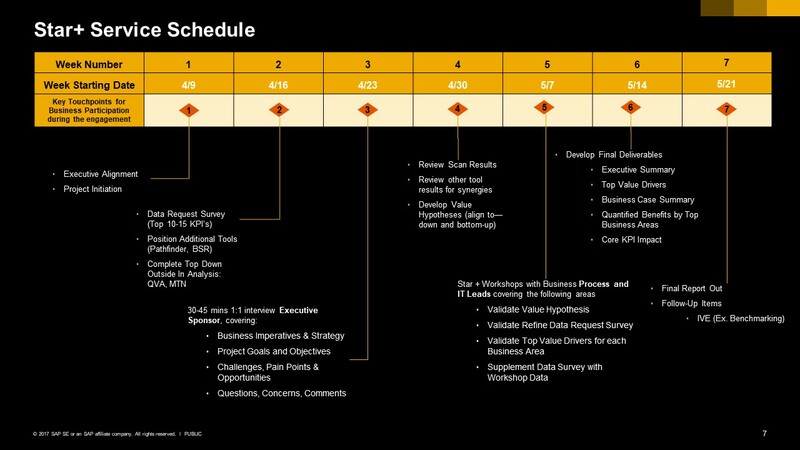 In Part II of this series I will cover the details of the discovery and validation workshops, including some examples of scan results, and more importantly how those results can be interpreted and used in conjunction with a benefits analysis to form the foundation of building a benefits case for S/4 HANA.